When it comes to man’s best friend, most people are not just looking for a furry pal, but a companion that’s suitable for their lifestyle. For certain households, finding the perfect pooch can be determined by his level – or lack of – aggression. Specifically, in the case of homes with small children or the elderly, a mellow dog is obviously an ideal fit. Although many experts and dog owners alike will agree that it’s an issue of nurture vs. nature – in other words, it’s not necessarily the breed itself but how the dog is raised – there are particular breeds that are recognized for their laid-back dispositions and friendly, non-aggressive demeanors. This article will explore some of the least aggressive dog breeds to consider when choosing a four-legged friend. With their expressive faces and droopy eyes, this short-legged medium-sized breed possesses an easy-going temperament that makes them an ideal companion for kids, seniors and individuals with limited mobility. Although they may look sad, Basset Hounds are actually quite outgoing and playful. Originally bred in France and Great Britain as hunting dogs, their short-haired coat requires weekly brushing and grooming, as they shed frequently. Available in brown, black or white tricolors, some Bassets can also be blue or grey. One of the benefits of this low-key breed is their ability to adapt to an array of environments, which makes them perfect for apartment living. 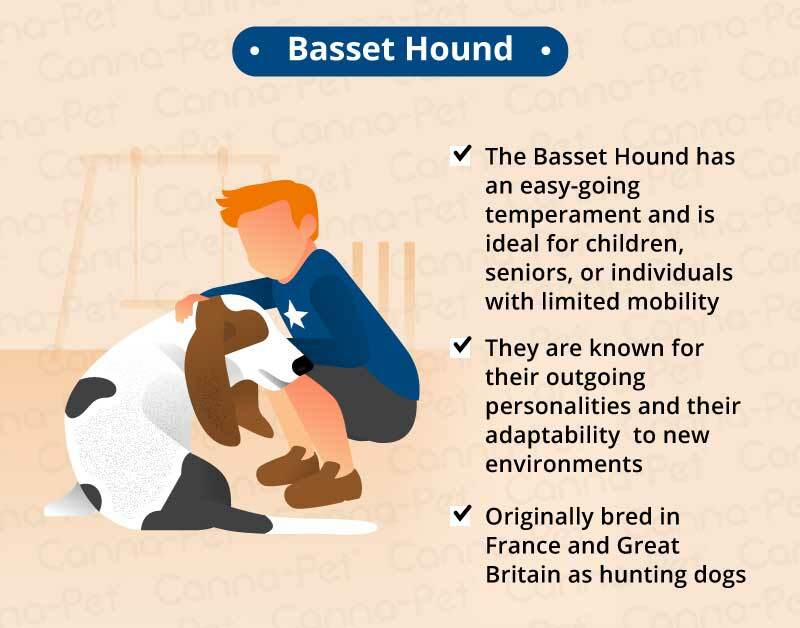 Beloved for their gentle nature and merry personalities, this small to medium-sized breed thrives in family environments, and is especially good with young children. This short-legged, short-haired breed typically features a tri-colored coat that is easy to maintain. 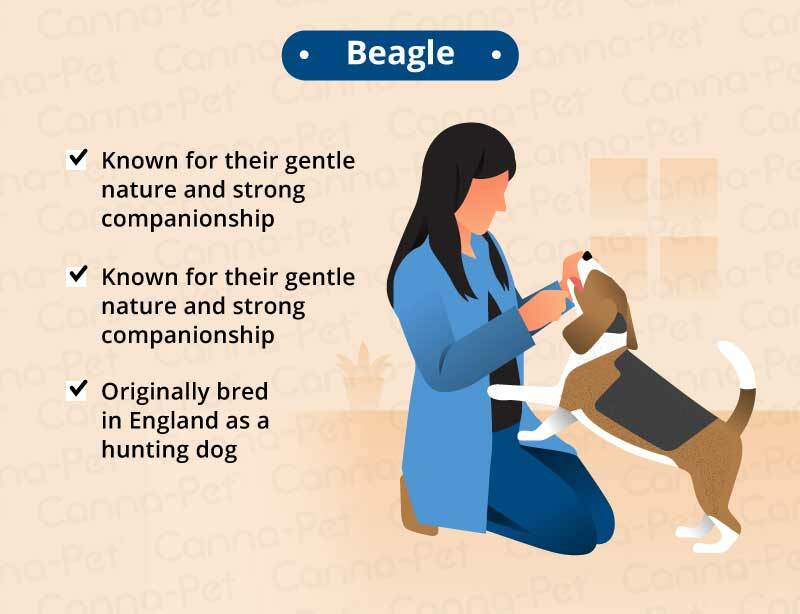 Originally bred in England and deployed as hunting dogs, Beagles are energetic and require careful supervision, as they are easily excited by various smells when outdoors. Due to their overall friendly dispositions, they get along with other dogs and even strangers, rendering them ineffective guard dogs. Although they are prone to canine separation anxiety and boredom, this breed is not known for aggressive behavior. Prized for their loyalty and friendly, calm disposition, this large and sturdy breed is a great watchdog and family companion, and is wonderful with kids. 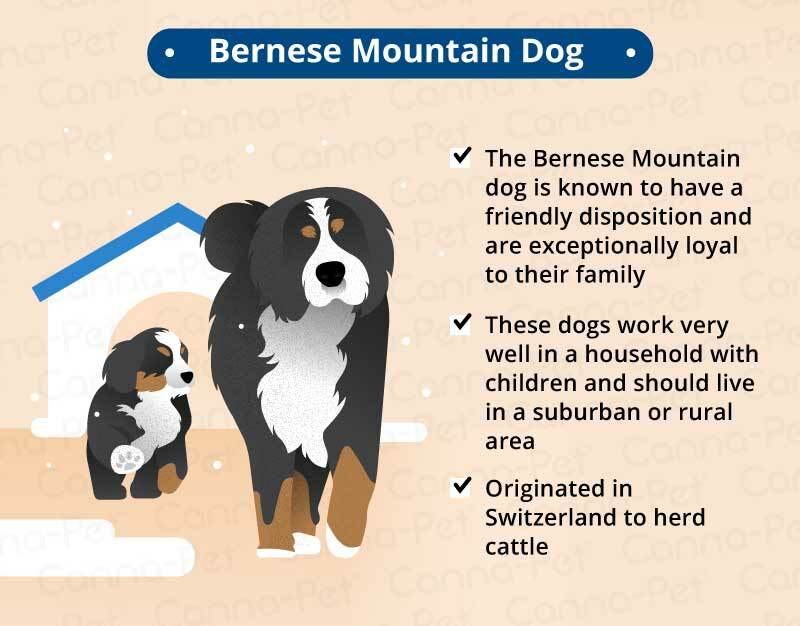 Hailing from the farmlands of Switzerland, this workhorse of a dog was originally bred to herd cattle and is therefore suited for herding in rural areas and easily trained. Featuring a multicolored coat, they are one of four types of Swiss Mountain Dogs and the only one with long hair that requires regular brushing, as they shed often. Bernese Mountain Dogs can be fairly vocal and are affectionate and sensitive. Because of their substantial size as well as their need for exercise and open space, they are best suited for suburban or country dwellings or homes with access to a yard or a park. Originally known as Brittany Spaniels, this sweet-natured, sensitive medium-sized breed is both eager to please and friendly, making them a loyal four-legged friend especially suited to a calm environment. In addition to learning quickly and becoming attached to their owners, these peaceful dogs are polite and gentle with everyone and also get along well with other animals. The Brittany’s coloring varies and is usually tricolor; they have a feathered coat and require minimal grooming and bathing. 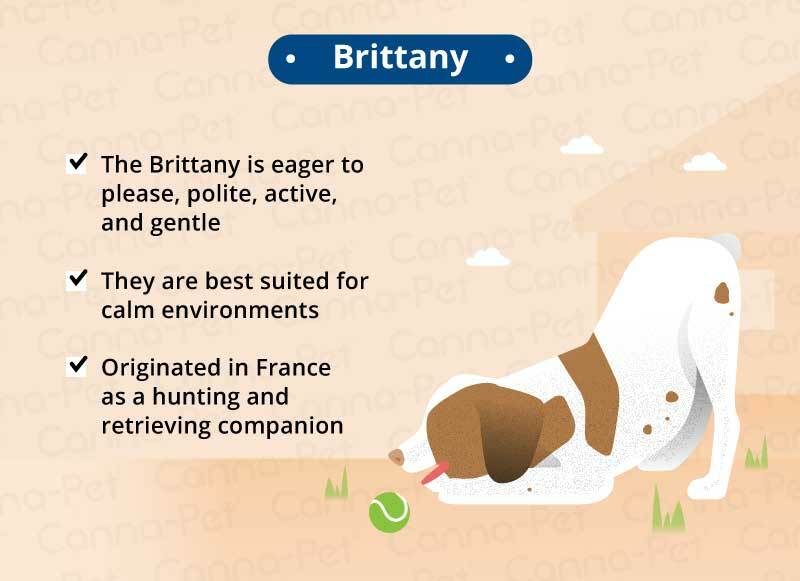 The name ‘Brittany’ refers to the region of France they originated from, where they were raised as hunting and retrieving dogs dating back to the 17th century. These dogs are fairly energetic and require vigorous exercise. Proper socialization at a young age is also encouraged to prevent them from becoming too submissive or shy. Although they have a tendency to experience boredom or anxiety if not properly cared for, these affectionate pooches make a lovely addition to an attentive family. Characterized by their muscular physique, short, stocky build, upturned nose and unique wrinkled face, this medium-sized breed includes several varieties, including the English, French, British and American bulldog. 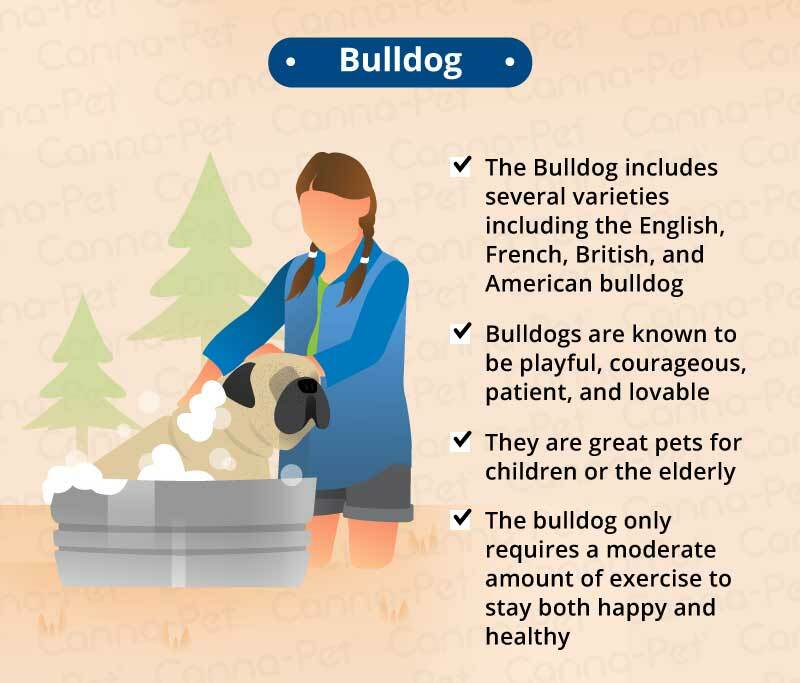 Despite their grumpy-looking facial expressions, Bulldogs are quite friendly, playful, courageous, and patient, rendering them loveable companions for households with kids and the elderly. They also get along well with other dogs and pets. Although their coloring may vary, their coats are short, sleek and flat, requiring weekly grooming, as they shed seasonally. Officially recognized by the American Kennel Club in 1886, Bulldogs were listed as the fourth most popular purebred in the U.S. in 2015. Relatively calm and quiet, they do not need excessive amounts of exercise. A dignified breed that is neither vicious nor aggressive, they are recognized as excellent family pets due to their ability to form strong bonds with children. 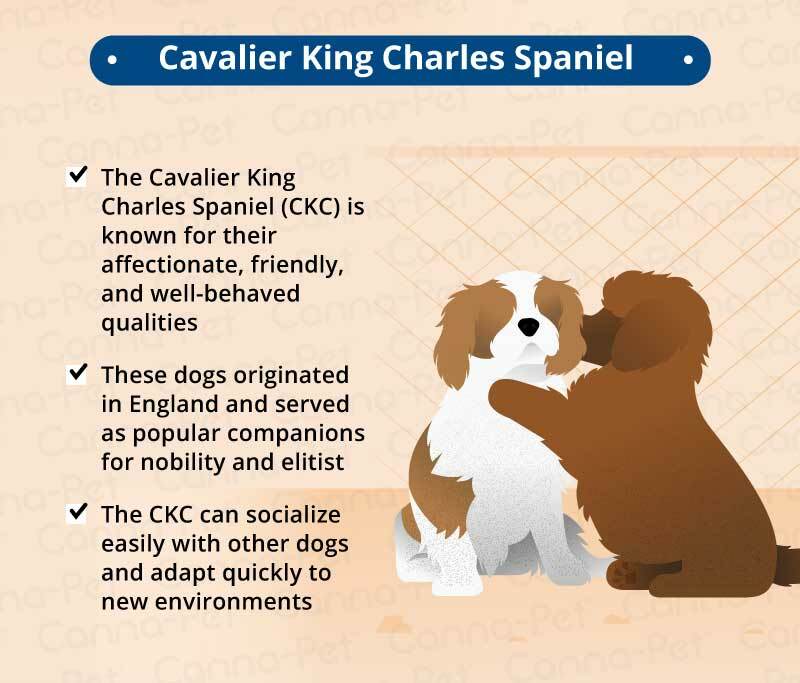 Noted for their sweet and gentle disposition, the Cavalier King Charles Spaniel (CKC) is a small spaniel classed as a toy dog by The American Kennel Club. 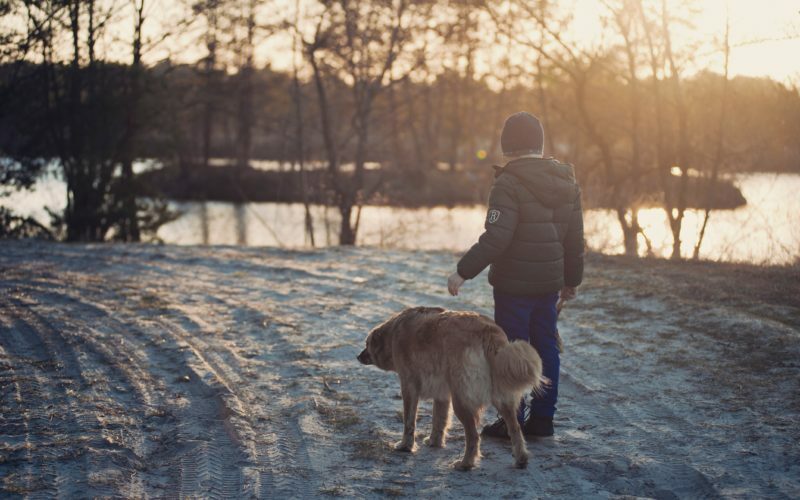 Affectionate, friendly and well-behaved with both kids and other animals, they require a fair amount of human interaction to thrive and shouldn’t be left alone for long periods of time. The breed has varying colors and markings, and their feathery, silky coat requires weekly brushing, but no trimming. The breed can trace its lineage back to 18th century England, where they were wildly popular amongst nobility. To this day, they remain a favorite, listed as the 18th most popular pure-breed in the U.S. as of 2013. Prized for their loving, naturally curious and affectionate nature, they socialize easily with other dogs and adapt quickly to nearly any environment. Additionally, they do not require excessive exercise. Although they are fairly intelligent, obedient, and hunters by nature, they are just as content napping or curling up on their owner’s lap. Made famous by the 1950s television series Lassie, this gorgeous medium to large-sized breed has remained popular among dog enthusiasts far and wide and is esteemed for their loyalty and protective nature towards small children. In addition to getting along well with kids, they also do well with other animals; however, they must be well-socialized early on to prevent shyness. Available in different color variations, Collies’ double-layered coat requires a significant amount of grooming to maintain the dog’s health. With origins dating back to 19th century Scotland, these dogs were used and bred for herding. Consequently, they are easily trained to work within different capacities, including search and rescue, therapy, and guide dogs for the blind. 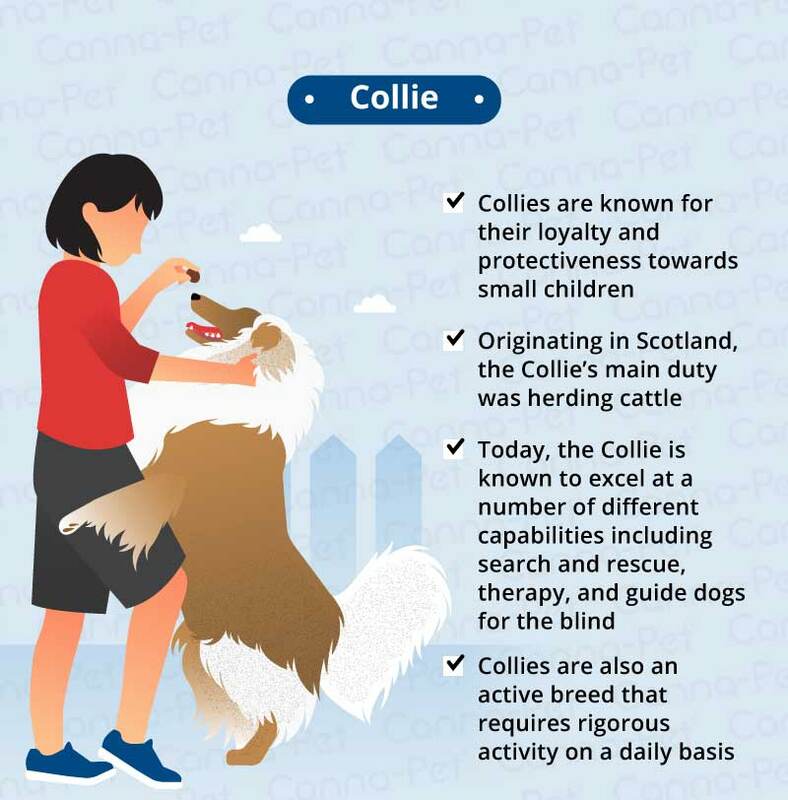 Due to their immense coat, owners must be cautious about exercising Collies in the heat; however, they don’t require rigorous activity beyond playing outside and daily walks. Eager to play, learn and protect their family, this cheerful breed is a great option for pet owners with larger homes and plenty of space. 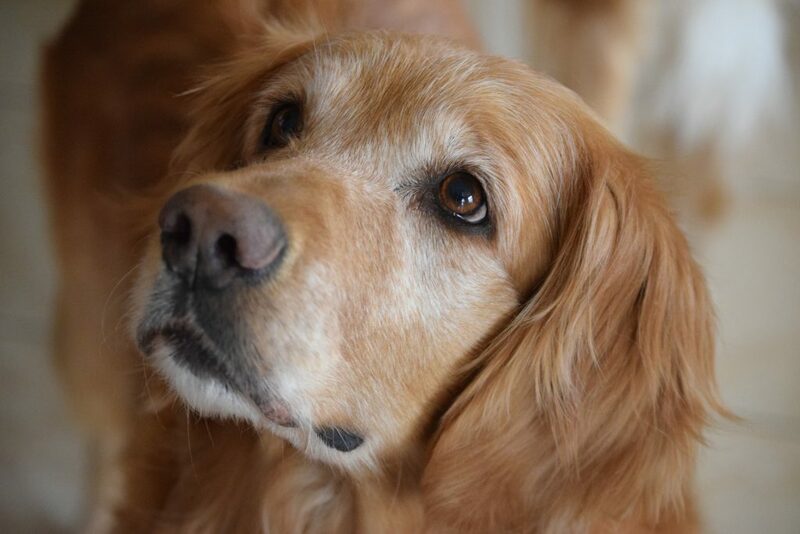 The Retriever refers to a dog group that includes popular large-breed varieties such as the Labrador Retriever and Golden Retriever. Originally bred to retrieve game birds and small game for hunters, they have a predisposition to obedience, learning and pleasing their owners and are commonly utilized as assistance dogs. They are also recognized as one of the least aggressive dog breeds, and are therefore well-suited for families since they get along wonderfully with children. Energetic and social creatures, they require at least an hour of exercise a day to flourish. Due to their easy-going dispositions, they easily form bonds with people and are not typically snappy, hostile or ‘one-man dogs’; however, they don’t make good guard dogs. 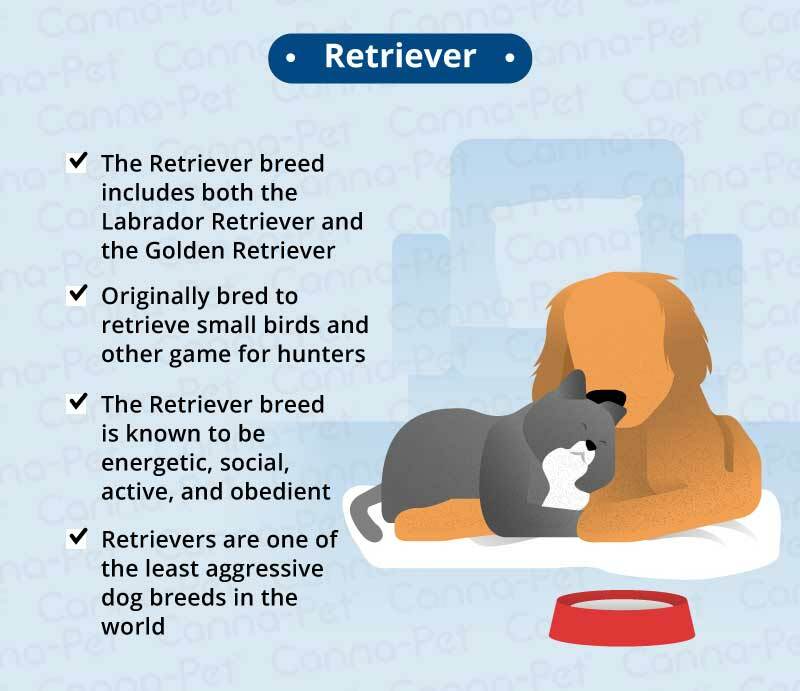 However, it is important to note that each variety or Retriever’s origin may vary slightly due to breeding and pedigree. In addition, they come in a wide range of colors and boast a slightly wavy, water-resistant topcoat that sheds throughout the year; grooming includes regular brushing and occasional baths. 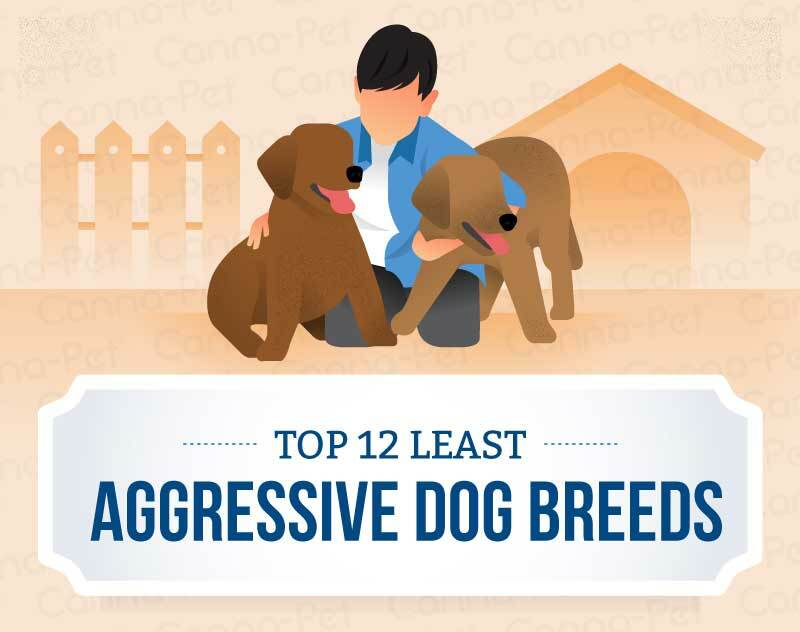 With their upbeat personality and fierce love of their family, it’s no surprise they are considered one of the least-aggressive breeds in the world. Recognized for their massive stature, this large breed dog is also nicknamed the ‘gentle giant’ due to their good-natured and loyal disposition. Despite their colossal size (which can be intimidating to some), they are quite calm and docile, rendering them excellent working or companion dogs. They are especially adept with children, which has earned them another nickname, ‘nanny dogs’. Throughout history, Newfoundlands have been notorious as live-saving and rescue dogs, due to their courageous and brave demeanor. Their appearance varies, with standard colors including black, brown, grey and white-and-black. They have webbed feet and a water-resistant coat that requires weekly brushing to prevent mats in the undercoat. Dating back to the 1800s, the Newfoundland breed originated in Canada and was utilized initially as a working dog, including fishing, retrieving, hunting and hauling heavy equipment. This breed does best in homes where they can receive plenty of exercise, as this is a fairly active dog. 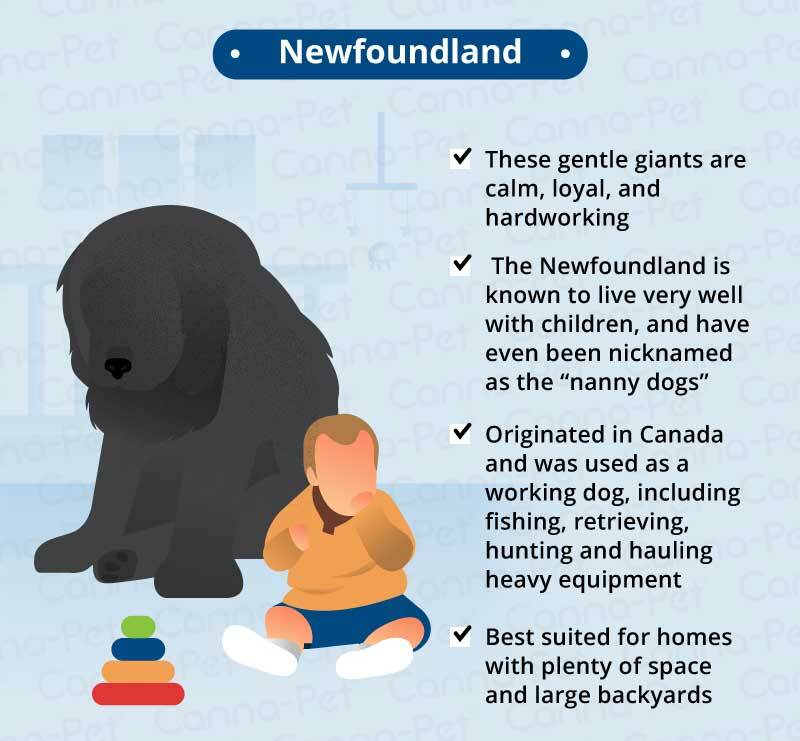 It probably goes without saying that Newfoundlands will be most comfortable in a home with ample room and access to the outdoors, and are best-suited for owners with a sense of adventure and the ability to care for this larger-than-life canine companion. 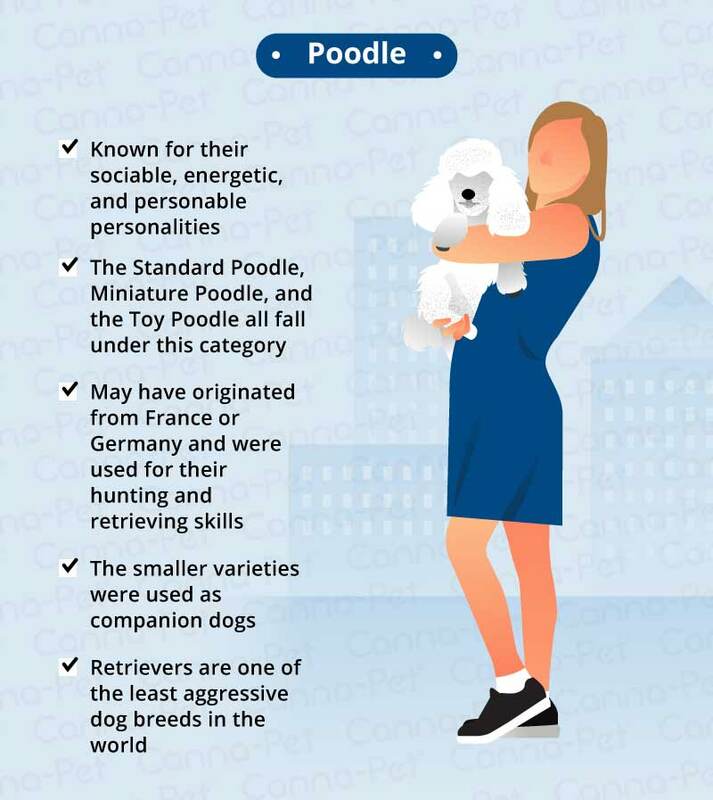 Adored for their laid-back temperaments, intelligence and ease of training, Poodles refer to a group of formal dog breeds, the Standard Poodle, the Miniature Poodle, and the Toy Poodle. Polite and gentle in demeanor, this elegant and playful breed requires both physical and intellectual activities to flourish. Sociable, personable and energetic, they dislike being left alone and may get anxious when left in the house by themselves. The breed has a wide variety of coloring and boasts a distinctive coat that is composed of dense, curly fur that sheds minimally (an added benefit, as they are considered ‘hypoallergenic’). House pets may be clipped into a lower-maintenance cut for ease of grooming; however, show dogs require a great deal of care and upkeep. All Poodles should be brushed frequently to prevent matting, with grooming to take place every 6-8 weeks. With their roots going back as early as the 15th century, there is still some dispute as to whether the breed originated in France or Germany. Standards were initially bred as retrieving and hunting dogs, while the smaller varieties were bred as lap/companion dogs. Poodles enjoy activity and excel at a variety of sports; therefore, they should be walked or exercised often. Among the three varieties, Standard Poodles are the most highly recommended for families with young children. They also do well with elderly companions. A fairly rare breed, these independent, smart and loving dogs are easily trained and make delightful companions. They also excel within service roles, including hearing dogs, mobility dogs, therapy dogs and seizure response dogs. 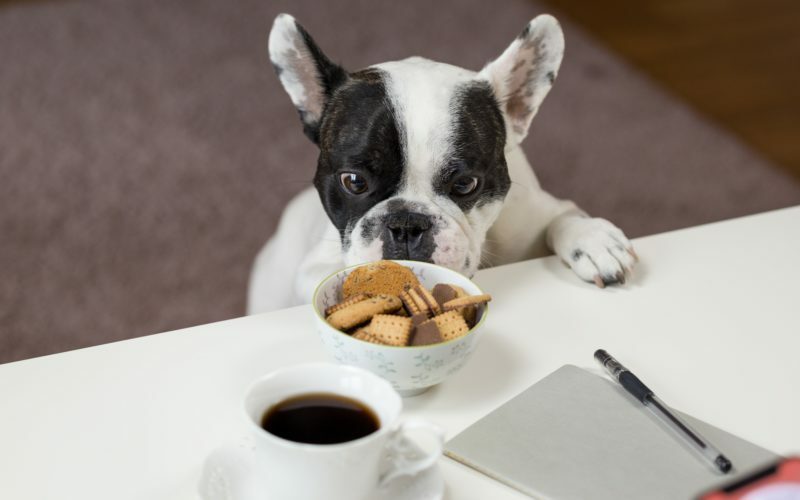 Because of their highly intelligent nature, this breed requires a great deal of mental stimulation and physical activity; they also do not like being left alone for extended periods of time. 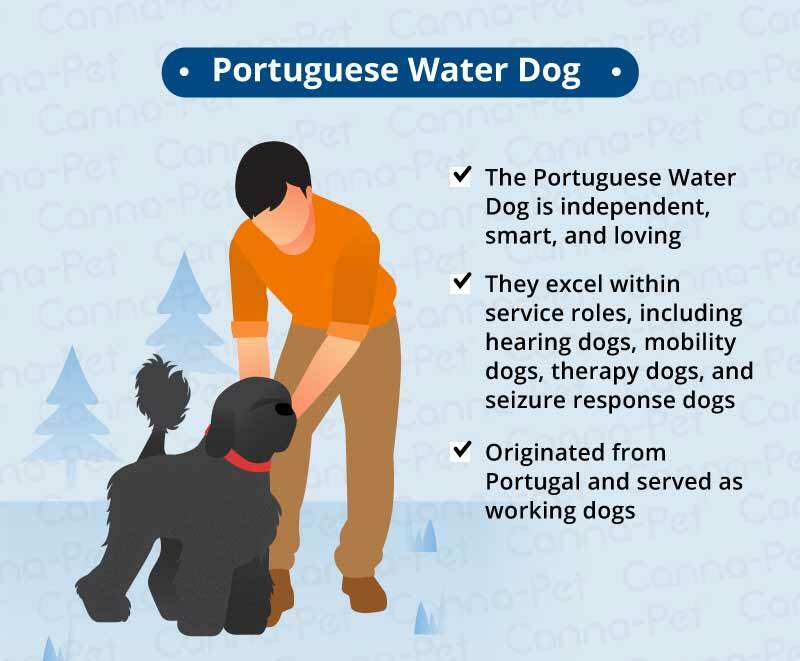 Portuguese Water Dogs may come in a variety of colors (solid or with markings), and boast a single-layer coat that does not shed; making them an ideal choice for people with allergies. History traces this breed back to ancient Europe, and may share a genetic pool with the Poodle. Originally trained as working dogs serving fisherman in coastal regions, these energetic dogs need regular exercise to prevent boredom. Both gentle and patient, they make excellent companions for equally active owners. These pint-sized, yet sturdy pooches are beloved for their big personalities and get along marvelously with children. It’s therefore no wonder they have grown in popularity among pet owners over the past decade. Strong-willed, playful, and charming, this clever breed enjoys socialization and is naturally protective of its owners, yet does not display signs of canine aggression. Pugs crave attention and affection from their owners, often ‘shadowing’ or following them around. 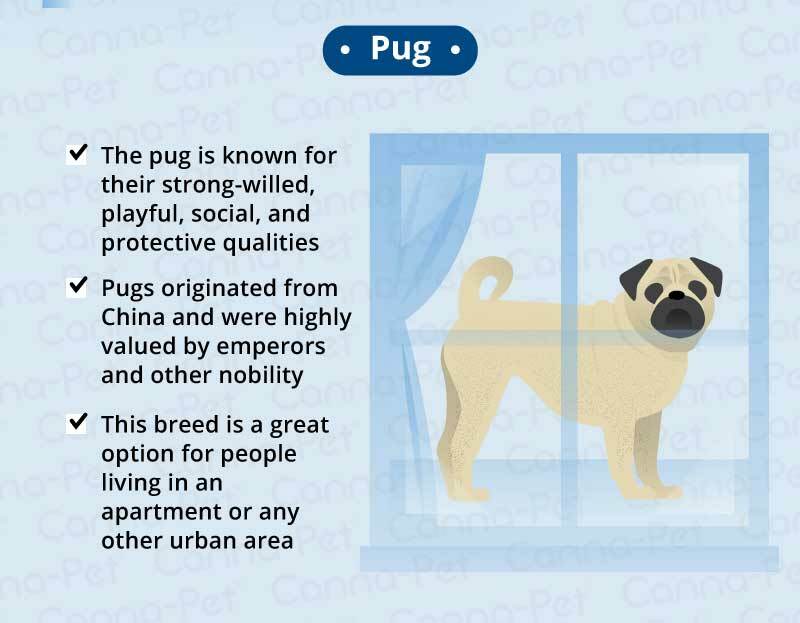 This toy breed comes in a variety of colors, with distinguishing physical characteristics including a short-muzzled, wrinkly face, compact body, curled tail and well-developed muscles. With roots originating in China as early as the 16th century, they were highly valued by Chinese Emperors and have retained devotees since ancient times. Since they don’t require a great deal of exercise, they are a great option for people living in apartments or other urban areas. “Least Aggressive Dog Breeds: Factors And Top 10 Breeds.” DogsAholic, 2 Aug. 2017, 8 July 2017. www.dogsaholic.com/breeds/info/least-aggressive-dog-breeds.html. “Top Ten Dogs for Kids.” PetMD, Accessed 8 July 2017. www.petmd.com/dog/slideshows/care/top-ten-dog-for-kids. Brown, Sheila. “10 Most Aggressive Dog Breeds: Temperament Ratings and Information.” PetHelpful, Accessed 8 July 2017. www.pethelpful.com/dogs/10-Most-Aggressive-Dog-Breeds-Temperament-Ratings-and-Information. Lewis, Betty. “10 Least Aggressive Dogs.” Cuteness, 9 Feb. 2017, Accessed 8 July 2017. www.cuteness.com/article/10-least-aggressive-dogs. “Small Dogs Who Are Kid Friendly.” Dogtime, 13 Dec. 2016, Accessed 8 July 2017. www.dogtime.com/dog-health/general/5261-small-dogs-kid-friendly.